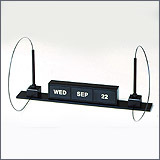 Consists of two theft resistant Sentry pens with nylon coated aircraft cable and full date perpetual desk calendar on 17.5 x 2 anodized aluminum base. Furnished with non-slip base. Double-coated adhesive available on request - please specify when ordering. Pens accept Jumbo Jogger ballpoint refills.